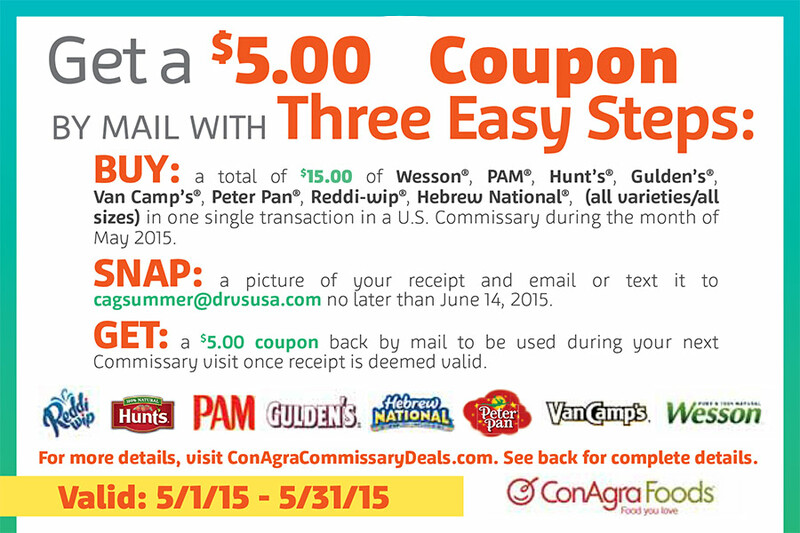 Celebrate summer with ConAgra Foods and get a $5.00 coupon back in the mail. Spend $15 on any combination Reddi-wip®, Hunt’s®, PAM®, Gulden’s®, Hebrew National®, Peter Pan®, Van Camp’s® or Wesson® (all varieties/all sizes) at any commissary worldwide in May. Snap a picture of your receipt and submit it to TPG no later than June 14, 2015. Get a $5 coupon back by mail to be used during your next commissary visit.